Between the stolen funds and sick kids, I've done almost no after-Christmas shopping. That's okay, 'cause I've stopped stockpiling as many generic gifts these days. Ivy at Home-Ec 101 reminded us not to overlook grocery stores for markdowns, and she was right. Kroger clearanced an entire aisle of gifts and wrap, including non-holiday specific baking supplies like sets of 4 ramekins for $2. The best part? It didn't take a separate shopping trip to scoop up a few deals. I diverted my money to a clearance cart of artichoke hearts (.89/can) and pumpkin pie filling (.48/can)--two items I rarely find with coupons, let alone in organic form. Also picked up a couple gallons of organic milk reduced to $2.48 each. 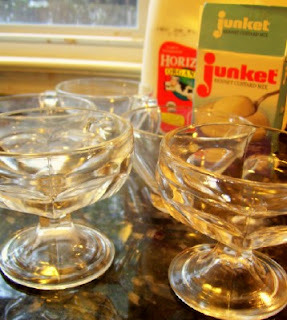 Making a retro clearance favorite: junket. I'm very well stocked on organic pumpkin pie filling and organic pumpkin puree after Thanksgiving - getting cans of each for 3/$1, which is an unheard of price for anything organic around here. None of the cans expire until late in 2008, so I was able to buy enough to allow for a few pumpkin pies during our New England winter and pumpkin muffins and cookies throughout the rest of the year. Pumpkin is one of my favorite things/flavors. Yippee. Do you have plans NY Eve? We're hosting a small party here, a very kid-friendly gathering that will end when pre-bedtime grumpies start. To keep things easy, cheap and kid-friendly we're doing two kinds of soup/stew (one veggie and one beef, a small crudite platter, and no knead rolls. One guest is bringing cheese and crackers, the other a savory stuffed bread. And, with the last of my Christmas cookie decorating goodies we'll be doing decorate your own sugar cookies with the kids for desert. The beef part of the stew is courtesy of a big hunk of roast I froze in it's own gravy a few weeks back, and the making it into a stew part is courtesy of your excellent idea/post the other day! I'm learning so much here. I have never, ever heard of Junket! Is this a southern dessert? Funny you posted this as I just posted my grocery store deals yesterday. Of course it wasn't all of the shopping I did, but definitely my most thrilling. I know about junket from my mom's memories! I'm not sure I ever made it, but I bet it's very kid-friendly. I saw Ivy's post too, and I LOVE my grocery store because they have a bent & dent and seasonal clearance section year round! I hadn't seen this before in other grocery stores. Thanks for the love! I saw your post on the top of our aggregator and I was like, "Ivy the brilliant", faaaabulous! Then I clicked over and saw you actually DID mean me. Whee! Thanks for making my day! Up north here Junket is used as a stand-alone dessert, but down south my grandmother always put it in her homemade vanilla ice cream. Ohhh, so you like organic milk, too, eh? We put Junket into our ice-cream mix for homemade ice cream. Is that what you do with it?